NeapolitanTrips Hostel, Neapol, Włochy : Rezerwuj teraz! 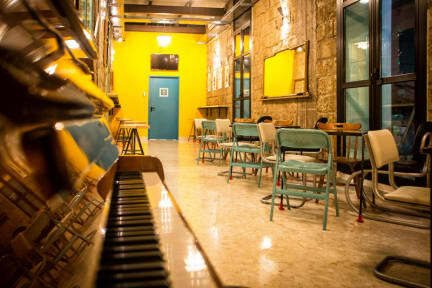 NeapolitanTrips Hostel and Bar is a new hostel in the center of Naples born and managed by the unbridled passion of young Neapolitans for their city. The hostel's aim is precisely to ensure a stay that is not anonymous, but transmits guests the beauty and liveliness of Naples. That's why we offer, from the morning, the typical flavors of our city. In this way our guests will start every day their trip into the 'neapolitan world'. NeapolitanTrips Hostel and Bar position is simply perfect for any needs: 1 minute walking from the main shopping street (Via Toledo), where you can admire one of the most beautiful metro station in Europe 'Toledo station', 2 min walking from 'Funicolare Centrale' that let you quickly reach the hill of Neaples,the Vomero neighborhood with its fantastic 'Certosa di San Martino'. We are also 5 min walking from the port and in 10 all points of the historic center. 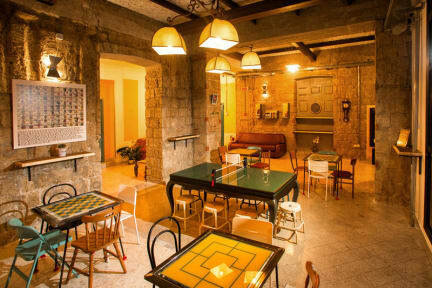 The NeapolitanTrips Hostel and bar counts with 10 dormitories, including 2 private rooms. Each dorm has an independent air conditioning, blackout curtains, drawer with safety lock and an indoor dressing room with mirror. The shared bathrooms are equipped with shower, shower gel, heating and hair dryer. The price includes bed linen and towel and free ingredients in the kitchen.Ttype of beds: bunk beds in dormitories and double+single bed in private rooms. NeapolitanTrips Hostel and Bar Policies and Conditions. Check in until 00:00 . The property might pre-authorize your credit card. If the pre-authorization fails, the property keeps the right to cancel the reservation. The reception will be open until 2am.